I had a wierd dream last night. I was walking on the seashore making foot imprints on the sand. After a point of time,I turned back to check my footmarks. 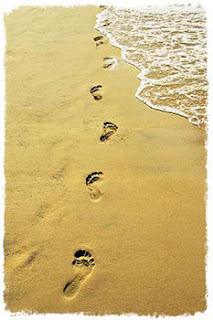 I was amazed to find that all my right leg footmarks were washed away by the seawaters. The left leg imprints were still intact. it means somebody else is running away with ya better half! please be careful,n safeguard ya woman!!! then ya probably got to look into the mirror- ya left eye may be missin, tats ya ya can't see ya left feet..
** I was amazed to find that all my right leg footmarks were washed away by the seawaters. The left leg imprints were still intact. one shouldnt constantly check if the finished walks in life were RIGHT...what's LEFT of the walk is what matters. I just thought of it...how did u think of the same one?? that was the answer i had in mind... wanted to float it around.. you played with words? it means you were playing dodge ball with just one foot, you manchild! LOL... it means u know to walk with ur left foot better!!! What's LEFT is RIGHT! Simple.